AdvantaPure announces that U.S. patent 8,870,230 has been assigned to its AdvantaPass wall pass-through technology. Introduced earlier this year, AdvantaPass is used to transfer large volumes of fluids between clean rooms during pharmaceutical and biopharmaceutical production. The system maintains the separation of room atmospheres and minimizes cross contamination risks. 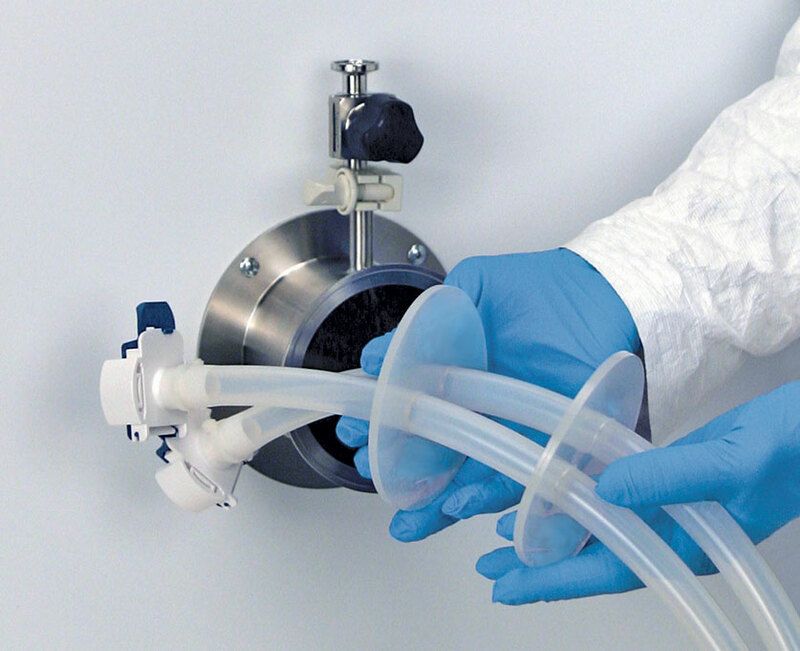 AdvantaPass combines single-use tubing, connectors and seals with permanent, wall-mounted stainless steel components to eliminate cleaning validations associated with clean room protocols. It’s the first system of its kind to provide complete isolation between manufacturing suites when conveying multiple lines of fluid through a single wall portal. This uniqueness – using a single portal for more than one transfer line – is part of why AdvantaPass was awarded the patent from the U.S. Patent and Trademark Office. No other system is designed to manage more than one line per wall portal without breaking protocol and risking room or product contamination. Another benefit of AdvantaPass is that it saves time and expense over the sterilization and validation requirements of traditional hard piping transfer systems. Its Single-Use tubing and components are available in platinum-cured silicone or AdvantaFlex® biopharmaceutical grade thermoplastic elastomer (TPE). Additionally, AdvantaPass is typically less costly than other wall pass-through systems. For more information on patented AdvantaPass, contact the AdvantaPure team at 145 James Way, Southampton, PA 18966; phone 888-755-4370 or 215-526-2151; fax 888-258-4293 or 215-526-2167; e-mail: sales@advantapure.com; or visit http://www.advantapure.com/advantapass.htm. The AdvantaPure division of NewAge Industries is ISO 9001:2008 certified and specializes in high purity tubing, hose, single use systems, manifolds, and other molded components for the pharmaceutical, biomedical, food, beverage, and cosmetic industries. All products are manufactured, stored, and shipped using the cleanest methods possible to ensure unsurpassed product purity.